The ex-Methodist church in Floriana, now government property and renamed Robert Samut Hall, houses an interesting 2 manual pneumatic Willis organ. This organ has been unused for about 8 years. Its blower was missing. 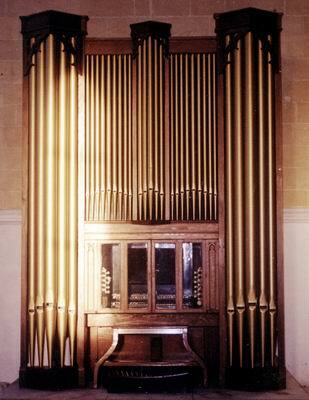 However when another blower was connected to verify the state of conservation it was found that the organ had vast action problems and was therefore unplayable. It was in dire need of a thorough restoration. In 2003 the renovation of the hall was in its final stages. It was required to re-located the organ to another part of the hall. Its location was incompatible with current safety requirements since it was partially blocking the only emergency exit. After some studies carried out with the architect in charge of the renovation works, Dr.Claude Busuttil, it was decided that the best new location would be in the middle of the opposite side � what one would call the �west end� if the hall were considered a normal church. A platform was built supported directly on the iron beams underneath the stone floor. The organ was carefully dismantled and re-assembled in its new location. At present the organ is still unplayable since it was just dismantled and re-assembled. Unfortunately no funds were available at the moment for a complete restoration. However thanks to the good sense of the people in charge of the Hall, the organ has been moved with care and safeguarded. 2 combination pistons per keyboard. 1 balanced pedal for Swell box operation. Original blower remote �on/off� switch placed under left column stops.